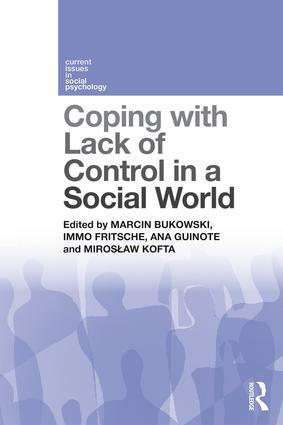 This book integrates various strands of research that have not yet been presented together in an innovative volume that addresses the issue of reactions to control loss in a socio-psychological context. Its focus on coping as an active way of confronting a sense of uncontrollability makes this a unique, and highly original, contribution to the field. Practicing psychologists and students of psychology will be particularly interested readers. Marcin Bukowski, Lecturer and Researcher, Institute of Psychology, Jagiellonian University, Poland. Immo Fritsche, Professor of Psychology, Leipzig University, Germany. Ana Guinote, Professor of Psychology, University College London, UK. Miroslaw Kofta, Professor of Psychology, University of Warsaw, Poland.